This is a random zine generator, a tool to help you make a thing. It’s a game that you can play. You can play it on your own. You can play it with friends, to spend an afternoon making together. You could play it through the post, mailing a zine back and forth until it’s completed. Random Zine Generator is a game and a zine. It teaches players how to make a zine, with a range of prompts to give them inspiration, and constraints to make things interesting. 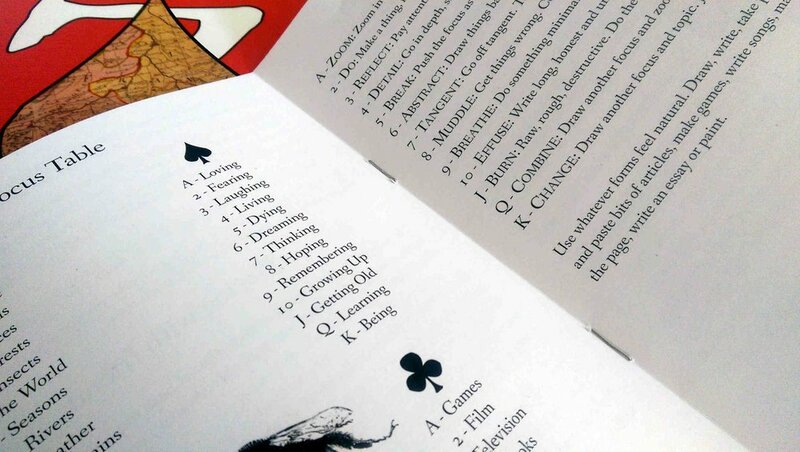 As a tool it can be played in a range of ways – whether creating something on your own or passing several zines around a group, each person adding a page. The party version of Random Zine Generator is designed for large crowds and has been exhibited at the V&A Lates, Press Fire to Win and Feral Vector. It encourages players to create images, text and pages about the surrounding exhibition or event, these are then compiled to make a zine recording what happened. It is available to run and can be customised to suit an event.